Almost exactly one month since the last battering the bombers returned and managed to not just hit the same part of Crewdson Road but to smash a chunk out of South Island Place too. Other Information Russian National; of 13 Varden Street. Husband of Sarah Jolka. Died at 39 Crewsdon Road. 2.11.40 2:27 AM Supplementary Report Crewdson Road. 23:15 hrs. High Explosive. 2 persons trapped on first floor. 1 since released. R/P in attendance. Road cleaning services required. 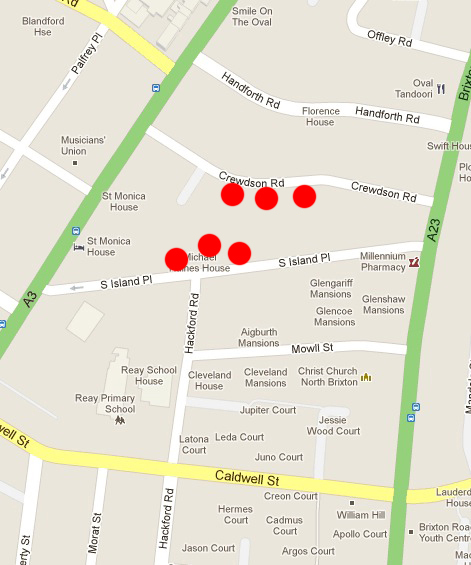 2.11.40 2:30 AM Supplementary Report South Island Place. 23:15 hrs. High Explosive. 26-48 South Island Place severely damaged. 5 slightly injured. 1 serious. R/P number 8 left for depot. Road cleaning services required. Several cases of shock were taken to Belgrave Hospital by wardens. 2.11.40 8:55 AM Please send car for a casualty (badly sprained or broken ankle) at 60A Brixton Road. Please call at post in direction (Crewdson Road incident) Casualty just discovered. 2.11.40 9:51 AM Supplementary Report One civilian death. Body at 39 Crewdson Road. M.O.H informed. 2.11.40 11:16 AM There are 48 homeless from the Crewdson Road incident in Christ Church Hall. Mr Wilcox informed. As there is not sufficient accomodation here any arrangements are being made. 2.11.40 14:06 PM Supplementary Report Crewdson Road & South Island Place. 23:15 hrs. High Explosive. 29 to 59 Crewdson Road uninhabitable. 31 to 51 Crewdson Road demolished. 26 to 22 South Island Place uninhabitable. 46 to 28 South Island Place demolished. I don’t know I’m afraid, basically the information that I use is what was logged by the Civil Defence teams and unless they wrote down the names of who lived where I do not have access to that information, the Census for this period will not be available for many years still. Can I ask who Cyril and Pauline were? Were they your relatives? If you let me know more information I might be able to think of other sources to look through, were they injured when number 37 was damaged? I’d be really interested in hearing more from you? My family lived at 61 Clapham Road (on the corner of Crewsden Road) and the house was badly damaged on the night of the 1st and 2nd of November 1940. We then moved to Brighton. My mother’s side of the family by the name of Hatley had lived in this house since the 1880s/1890s.